Project that is auto created once approved. Once you have created the proposal you can also simply download the pdf via the options tab top left > download pdf (This is for a draft/sent proposal). Note: this will not include the Contract, which will have to be downloaded separately via the proposals + contracts tab > 3 dots icon next to the proposal+contract. 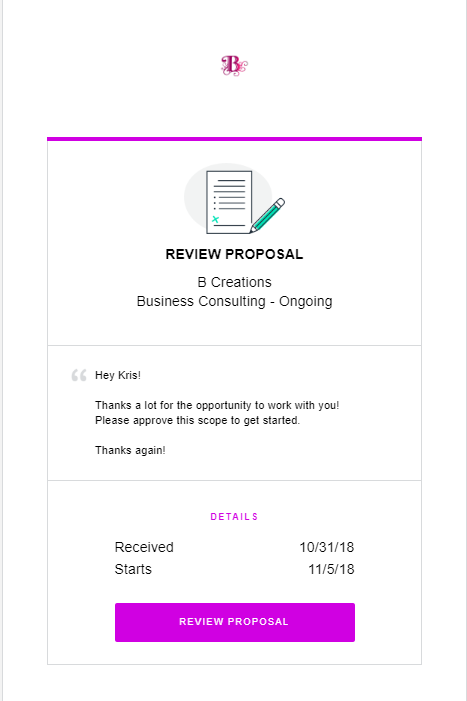 Alternatively, your client will also have an option to view the proposal/contract online via the email they receive, they can select to "review the proposal/contract online by selecting the "review proposal/contract" link in the email. If the Proposal had a contract attached or you just sent a contract once approved your client will be able to download the contract which is attached via their email they receive. When downloading the proposal/contract via the webapp please ensure you have disabled any pop up blockers in your browser. The pdf will download in a separate tab in your browser.